Eating healthy and working out are not a problem during vacations, but during school I never seem to have a minute to sit down or even take a break! I have to force myself to remember to eat! Linking up today with the fab collaborative blog, Teaching Trio to share a few of my favorite things to stay healthy at school! We’ve all heard it before, but it’s so important to keep hydrated!! I refuse to use disposable plastic water bottles (yes, I know they’re supposedly recyclable, but they still seem so wasteful). 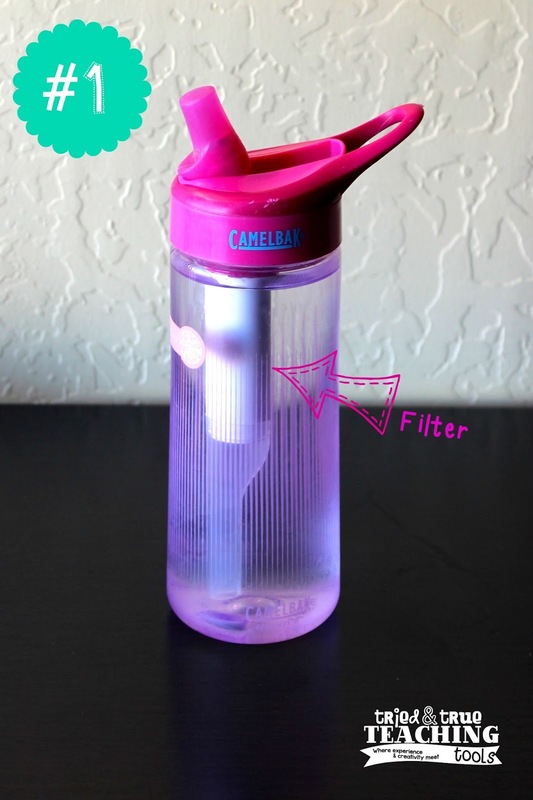 One of my favorite things that I can’t live without is my Camelback water bottle with filter. It helps me to track how much water I’m drinking; I make sure to drink at least 2 of these during the school day. The filter makes all water taste good, even yucky school water! 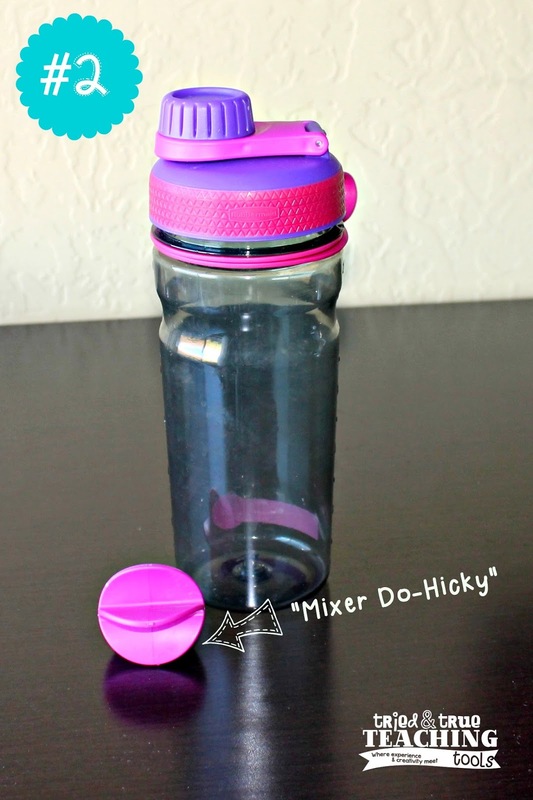 My next favorite “keeping healthy” thing is my new shaker bottle. I don’t know if there’s an official name for it, but I found this bottle in the local supermarket. It came with this plastic do-hicky (I don’t know what else to call it) that mixes powders smoothly. Sometimes I’ll bring some almond milk in a thermos to school and then mix in some protein powder. The problem was that even shaking it vigorously, my protein shake was lumpy and disgusting. This new bottle with the do-hicky makes my protein shake SMOOTH!! I have no idea how it works, but now I can drink one at recess or after school! 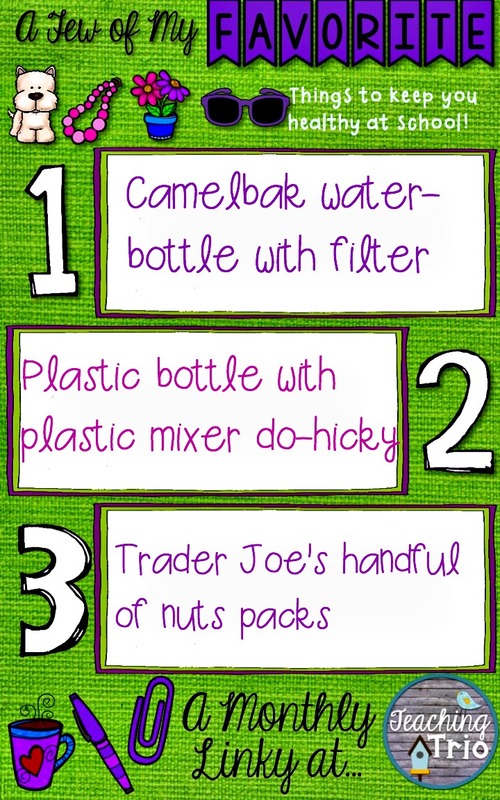 The last favorite to ensure I’m snacking on something healthy (and not all the donuts, cupcakes, bagels, and junk that well-meaning families tend to bring for teachers and staff at school), is Trader Joe’s "Handful of Nuts" packs. 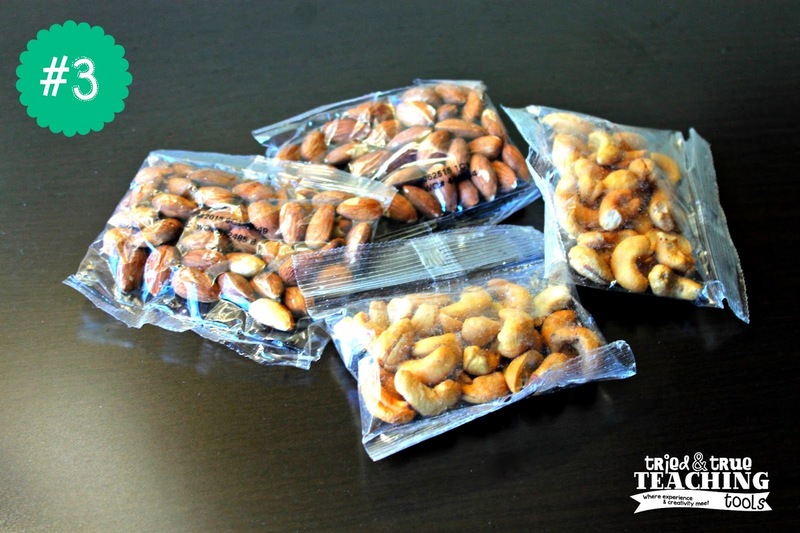 I always keep almonds and cashews in my desk drawer at school, ready to grab for a quick protein snack. Yes, I could probably save some money and buy the large bags and portion them out myself into ziplock baggies. But that one extra step realistically won’t happen in my schedule. I also keep a nut pack in my car, in my purse, in my laptop bag; everywhere, since as a busy mom, I always seem to be on the go (in the car)! Anyway, hope my 3 favorite things help you out, too! How do you stay healthy at school? Click on the button below to learn about more favorite anythings! Nuts are my go to snack too! Need to look for these at Trader Joe's! Justine, I fel so silly writing "do-hicky" but it was that or "thing-a-ma-jiggie"!! :) Whatever it's called; it works for blending though! !